So that the members are dynamic Catholics in this life and will be blessed with eternal life in the next. To be a Christ-Centered Catholic Community that welcomes all, worships and serves together, and inspires others to follow Christ. Love is the way — God's endless love provides the way for us to lead lives filled with love, compassion, forgiveness, kindness, empathy, and sacrifice. Christ is our foundation —He calls us to worship, pray, and love and serve one another unconditionally. Our faith is a journey - We are committed to lifelong growth in holiness through learning and prayer. A shared commitment to each other's well-being —Through fellowship, the establishment and expansion of a network of personal relationships, and joyful engagement with one another. Share the good news —We are called to make Jesus known and loved, through our words and by our actions. Enhance our welcoming culture to reflect Christ’s love and peace in the world by examining our current culture and incorporating best practices from other welcoming organizations/churches/institutions. We will revitalize our new-member welcome program, train volunteers and create intentional outreach processes to engage current parishioners and school families. 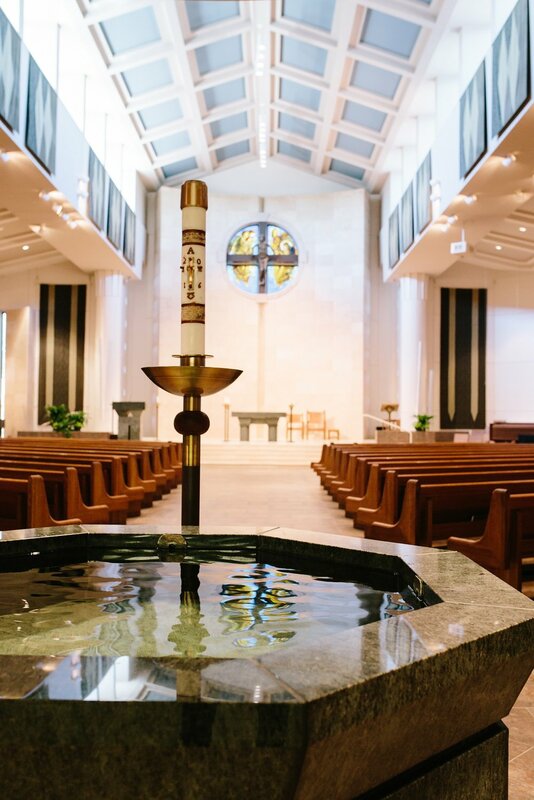 Strengthen our parish as members connect through personal engagement and social/spiritual events. Participation in the life our community will go beyond Sunday as faith-based relationships are built through church ministries. Support members as they grow in holiness by increasing the quality, variety and accessibility of faith-nurturing opportunities, including retreats, small group ministry, adult and youth mission trips and parishwide evangelization initiatives. Implement an enhanced volunteer system and establish a volunteer climate that grows and sustains all parish ministries. We look forward to helping you discern how God is calling you to share more of your gifts and talents inside and beyond our church’s doors! Commit to the knowledge and understanding of social justice by identifying, creating awareness of and responding to the issues within our parish and in the broader community. This will include service and outreach opportunities, educational forums, advocacy training, as well as parishwide initiatives that root our community in Catholic Social Teachings. Continue to provide quality education at St. Bartholomew Catholic School as we have done for over 60 years. Our challenging curriculum combined with state-of-the-art technology and student-centered instruction creates the conditions for our PK-6th grade scholars to achieve academic excellence. We are blessed with highly skilled and dedicated staff who model and teach the Catholic values and skills students need to succeed academically, spiritually and socially. Engage all parishioners in using their time, talent and treasure to fulfill our vision and mission. Our new strategic plan is a spiritual path that invites us to use the gifts we have received from our gracious God and return them with increase. When we engage in stewardship as a way of life at St. Bartholomew, we recognize that we already have more than enough and, in face, have more than enough to share. We trust that our generous God will always provide for us.